St. Augustine, Florida is known as the oldest, continuously occupied city in the continental United States. It was founded in 1565 by the Spanish conquistador and admiral, Pedro Menéndez de Avilés. With control of the area fluctuating between the Spanish, the French, the British, and the Native Americans, St. Augustine possesses not only a rich history, but many interesting places to visit as well. If you are looking for a school field trip with exceptional educational value, then call Sonshine Educational Tours today and let us help you plan your trip to St. Augustine. Located on the western shore of Matanzas Bay, this fort is one of the most popular tourist attractions for school field trips. The Spanish saw the need to fortify this area which was only a tiny garrison town at the time. The size of the fort is impressive and took just over 20 years to complete. The national monument includes a reconstructed part of the original wall, as well as the original gate into the city. One of the best aspects of visiting this fort is the opportunity to watch actors, dressed in period costumes, reenact the way that colonists would have lived at the time, as well as demonstrate how they would have used historical weapons, including the firing of cannon. This museum is on the National Register of Historic Places because it was built in 1883 by Franklin Webster Smith, who intended to use it as his winter residence. He wanted it to be a replica of the famous Alhambra Palace in Granada, Spain.The building itself was built using the construction method of poured concrete and crushed coquina shell. This style of architecture began the trend of Moorish Spanish Revival architecture in St. Augustine. School field trips to this museum will be rewarded with observations of the historical significance of this place and its influence of architecture in St. Augustine. One of the best features of taking a trolley tour is that tours depart every 15 minutes, and you also have hop-off-and-on privileges. With 21 different stops to choose from, there won’t be a dull moment during your day. Some points of interest where the trolley will stop are the Old Jail, the Spanish Military Hospital Museum, and the Colonial Quarter. The Old Jail was home to prisoners for more than 60 years and doesn’t really resemble modern-day jails at all. It was originally built in 1891 by Henry Flagler. The Spanish Military Hospital Museum allows you to see what healthcare would have looked like during the Spanish Colonial Period. The building itself is a reconstruction of what the original building would have looked like, and is built on the original site. The Colonial Quarter, also known as the Spanish Quarter, allows visitors to go back in time 300 years and engage in a variety of historical activities. The Lightner Museum is housed in the former Alcazar Hotel, which Henry Flagler built in 1888. The museum houses one of the finest collections of decorative art from the 19th century. School field trips will get to experience both pre- and post-classroom activities, as well as demonstrations of antique mechanical musical instruments, and interactive educational experiences in the gallery spaces. Specialty tours are also available and can be tailored to specific educational needs. This building is unique for a number of reasons, including the fact that it is the only wooden building remaining from the Spanish Colonial Period, as the British burned Spanish St. Augustine to the ground in 1702. The building was originally a home for the Genoply family. Juan Genoply was not only the original inhabitant of the home, but also the first school teacher. School field trips will be able to see textbooks and supplies that students would have used during the Spanish Colonial Period, as well as tour the kitchen and gardens. We have listed just a few of the places of historical interest that many school field trips visit. 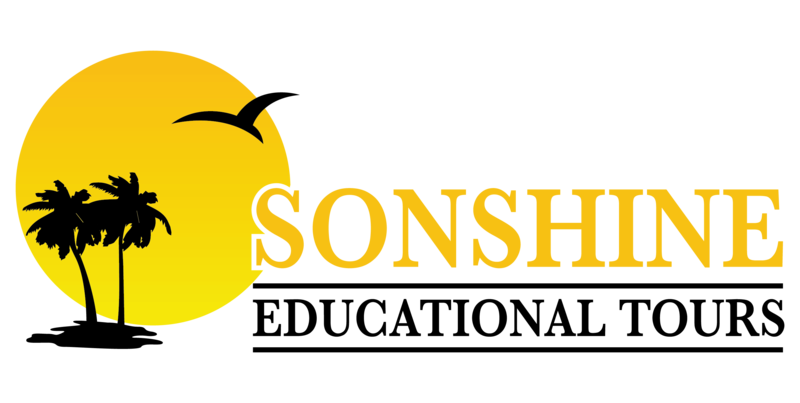 Sonshine Educational Tours will take care of all the details for you when you plan your trip with us. Contact us today to learn about all the cities we visit, as well as how we can tailor your tour to your specific educational needs. Make your next school field trip the best one ever!